Donald Trump (Alec Baldwin) gets an update about the Robert Mueller probe from Rudy Giuliani (Kate McKinnon) and Michael Cohen (Ben Stiller) after being comforted by First Lady Melania Trump (Cecily Strong). “Because you were like a son to me,” says Baldwin’s Trump. 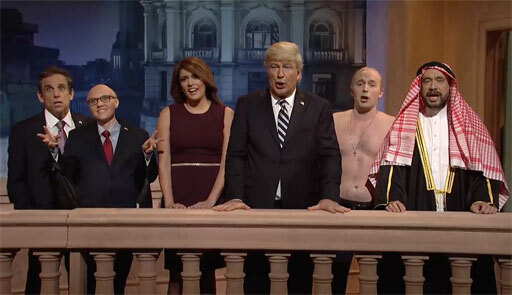 Plus, he confronts Vladimir Putin (Beck Bennett) about his handshake with the Crown Prince of Saudi Arabia (Fred Armisen) at the G20 Summit in Argentina. “Don't cry for me Argentina, the truth is I'm very guilty. Some little no-nos and maybe treason. But I kept my promise. Oops, no, I didn't," sings the Trumpeter at the end of the skit.